“The purpose of this article is to discuss on the various aspects of Knowledge Management practices in the Indian Public Sector Banks. At the outset, let me explain what Knowledge Management is all about. Knowledge Management refers to a multi-disciplined approach to achieve organizational objectives by making the best use of knowledge. It is the collection of processes such as acquiring, creating and sharing knowledge and the cultural and technical foundations that support them. Banks and financial institutions rely on gathering, processing, analyzing and providing information in order to meet the needs of their customers. Banks were among the early adopters of Information and Communication Technologies. The visible benefits of ICT in day-to-day banking in India are quite visible. Implementation of Core Banking Solution, ATM, Internet Banking, Mobile Banking, RTGS (Real-time Gross Settlement), NEFT(National Electronic Fund Transfer) etc. have enabled Indian Banks to manage increased transaction volume with large customer base in a very efficient, accurate manner leading to high level of customer satisfaction. Fast-changing technology, rising customers expectations and tough completion from private & foreign players have led Public Sector Banks in India to grow up in every aspects, including knowledge management, during the last decade. Orientation/Induction Training for new recruits- Banks conduct Orientation Programme or Induction Programme for all the new recruits to apprise them of the history, culture, strengths etc. of the Bank. Training- Banks provide training to their Employees through Bank’s own Staff Training Colleges (STCs), as well as through external training provided by premiere banking institutes like Institutes for Research and Development in Banking Technology(IDRBT), Hyderabad, National Institute of Bank Management (NIBM), Pune, Bankers’ Training College(BTC), Mumbai etc. Mentoring-One senior executive (normally Chief Manager & above) acts as a mentor to a new recruit for a specific period (normally one year). The mentor trains/grooms the new employee on technical/business/functional knowledge/skills. Brain storming session- Banks conduct brain-storming sessions on specific topics related to various banking/business/customer service etc. among staff members from different departments to generate new/innovative ideas to improve existing processes. Review Meetings- Periodic Review Meetings (Quarterly/Monthly) are held in every departments/branches/offices to review the business position/progress of the branch/department. The minutes of the important Meetings are circulated to various employee groups of select departments/executives. Quality Circles/Professional Circles-Voluntary groups of 3 or 4 Employees form a Quality Circle/Professional Circle & give Presentations to other Employees/Executives on a specific topic normally to improve a process/quality or provide a new idea or concept. Intranet/eLearning/Knowledge Portals- Banks implement Intranet/eLearning/Knowledge Portals, which contain Bank’s internal circulars, policy documents, manuals etc. Internal Magazines/News Letters-Banks publish (quarterly/monthly) magazines (usually on Banking, IT, Risk management, Economic Research etc.) where respective department contributes articles for the benefit of all employees. “In this article, I will discuss on the topic of the Mahatma Gandhi National Rural Employment Guarantee Act – one of the most ambitious social welfare measures of Government of India for poverty alleviation and rural development. The Mahatma Gandhi National Rural Employment Guarantee Act, popularly known as MGNREGA, is an Act to provide for the enhancement of the livelihood security of the households in rural areas of the country by providing at least 100 days of guaranteed wage employment (through unskilled manual work) in every financial year to every household. The very purpose of the scheme is two-fold, first to provide job on demand to ensure livelihood security and second, at the same time, to create assets to augment the basic infrastructures available to the rural people. The MGNREG Act was notified on September 07, 2005. The employment under MGNREGA Scheme (MGNREGS) is an obligation on the part of the Government to provide employment within 5km radius of the village at the minimum wage (for example, INR 174/- per day in the State of Karnataka), failing which an unemployment allowance is to be provided within 15 days. Along with community participation, the MGNREGS scheme is being implemented primarily by the gram panchayats. Under the Scheme, mostly the labour intensive works like creating infrastructures for water harvesting, drought relief and flood control are undertaken. 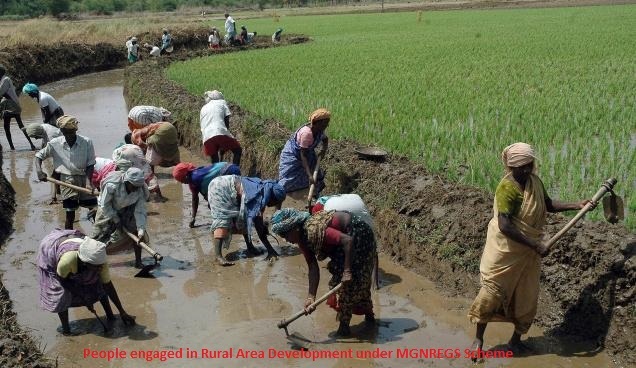 The MGNREGS Scheme is implemented in India through a web-based Management Information System (MIS) – “NREGASoft” to address the planning and monitoring needs of the Scheme. This is a local language enabled workflow based e-Governance System and is available in offline as well as online mode to capture all the activities under MGNREGA at the Centre/State/District/Block and Panchayat level. The payment of wages is made by the Government directly to the worker’s account by electronic means, called Direct Benefit Transfer System (DBTS). This DBTS system leverages the payment gateways such as Aadhaar Payment Bridge (APB), National Electronic Fund Transfer (NEFT), Real-Time Gross Settlement (RTGS), National Electronic Clearing Service (NECS) and Banks’ Core Banking Solutions. This DBTS facilitates the direct credit of the wage to the Bank/Post Accounts of the beneficiaries through automated processes. The report of the Comptroller and Auditor General (CAG) of India on the second performance audit of the MGNREGS that covered 3848 gram panchayats in 28 states and 4 union territories of India from April 2007 to March 2012 highlighted the 3 most significant factors – lack of public awareness, mismanagement and institutional incapacity. Accordingly, the 3 major recommendations were Capacity Building, Public Awareness and Effective Management. “In this article, I will discuss about the online tax payment services being offered by various banks in India. Banks play a very important role in facilitating the various E-Governance initiatives of the Government of India and various State Governments. 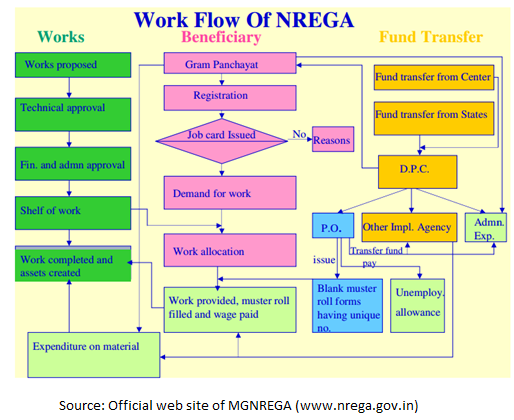 In various Government Schemes like Mahatma Gandhi National Rural Employment Guarantee Act (MGNREGA), Scholarship schemes for Students , pension schemes, LPG-subsidy schemes etc., the money is transferred directly (by the Government) to the bank account of the concerned beneficiary, through “Direct Benefit Transfer”. Such direct transfers eliminate the middle-men thereby enhancing transparency & effective governance, delivered by the Government directly to the citizens. The Indian Banking sector has witnessed substantial growth during the last 2 decades. With the financial reforms during early 1990s and subsequent technology adoption by banks have led to Banks’ significant growth. The new private banks with latest technologies like Core Banking Solution (CBS) from day one have prompted the “not so tech-savvy” public sector banks to adopt technologies. With the Reserve Bank of India’s initiatives for greater technology adoption by banks, all major banks have now implemented CBS in their Banks. All major public sector banks now have technology infrastructures comparable to that of the private counter-parts. In India, today, all major private and public sector banks offer almost all technology-enabled services like ATM, Phone Banking(24×7 Call Centre), Internet Banking, Mobile Banking, National Electronic Fund Transfer (NEFT), Real-Time Gross Settlement (RTGS), Cheque Truncation system etc. All major banks (public as well as private) in India now offer Internet Banking. Through Bank’s Internet banking, banks facilitate the online tax payment, in which the tax payer directly pays (online) the various taxes to the government. That too, with the comfort of sitting at home/office at any time convenient to the tax payer. Gone are those days when the tax payers had to stand in long queues for paying the taxes. Thanks to the Online Tax Payment Services! The Government has arrangements with various major banks (public and private) in India for online tax payment services. The taxes include direct taxes (Income Tax, TDS, Corporation Tax, Security Transaction Tax, Estate Tax, Wealth Tax, Gift Tax, Cash transaction Tax, Fringe Benefit Tax etc.) and Indirect taxes (Customs, Excise, Service Tax), various State Government Taxes like Value Added Tax (VAT), Entertainment Tax etc. Depending upon the arrangements made by the respective tax authority with the particular bank, there can be 2 models of how a tax payer can pay his taxes online. Model-1: Through the Web Site of the Tax Authority. Under this Model, the tax payer visits the web site (URL) of the concerned tax authority (example, for income tax, the tax payer visits http://www.incometaxindia.gov.in/). He selects/inputs appropriate options/values/amount, along with the choice of the “Bank” through which he wants to pay the tax. Depending upon the Bank selected, he is redirected to the respective Bank’s Internet banking site where he is asked to enter his Internet Banking login Id & password. The tax payer inputs his internet banking login id & password (additional authentication like Transaction password, One Time Password, Random number generated by a Token etc. may be required as per authentication procedure of the Bank). On successful authentication, the transaction gets completed with instant debit of the amount from the tax payer account with the bank followed by credit of the amount to the account of the tax authority with the Bank. The tax payer also gets instant Acknowledgement (called e-receipt) of the tax payment. Model-2: Through the Web site of the tax payer’s Bank.